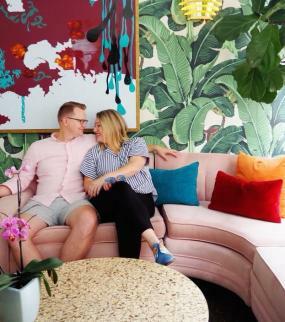 Located in the heart of downtown, the mid-century modern boutique hotel, The Dwell Hotel, is a great place for any couple. 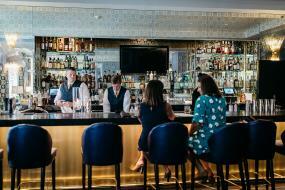 But foodies will particularly appreciate their in-house restaurant and bar, Matilda Midnight. The starlit space features a carefully crafted cocktail menu as well as a cravings and sweets menu complete with assorted local charcuterie, flatbreads, and classic bar snacks. Outside the luxury hotel awaits a smorgasbord of foodie-friendly restaurants, depending on your personal dining style. For low-key lovers, Chattanooga is rife with farm-to-table options downtown. There’s Urban Stack Burger Lounge that offers gourmet burgers (and chicken sandwiches) in a hip setting. The Meeting Place provides an upscale, romantic setting with some of Chattanooga’s best cuisine, cocktails, and an outstanding wine selection. But some V-day standouts (read: fine dining) have to be Hennen’s, Easy Bistro & Bar, and Back Inn Café. If you’re looking for luxury in the heart of downtown, plan a weekend getaway to The Read House Hotel. This historic hotel recently underwent a 28 million-dollar renovation to include modern amenities, lavish décor, and a Gatsby-like vibe throughout the property. The hotel is walking distance from the top attractions in the city and offers world-class amenities in a chic 1920s design. Visitors can unwind with a cocktail in the Bar & Billiard’s Room, dine at the upscale Bridgeman’s Chophouse, or sip on a latte from the Starbucks onsite. Start your weekend with a horse drawn carriage ride through downtown or the Southside. During the day, rent bikes with Chattanooga’s bike share system and ride across the Walnut Street Bridge to explore the Northshore, including scenic Coolidge Park, Renaissance Park, and the shops and art galleries off Frazier Avenue. Or, take a cruise down the Tennessee River an enjoy spectacular views from the Southern Belle Riverboat. In the evening, take the free electric shuttle to the Southside to stroll down Station Street and explore the Chattanooga Choo Choo property. Finish the night with a romantic dinner at Alleia, which offers rustic Italian inspired cuisine in a downtown setting. The Bluff View Inn is located in one of Chattanooga’s most inspired areas – the Bluff View Art District. Located in three turn-of-the-century homes atop the cliffs of downtown, Bluff View offers views as pretty as a picture and a location that’s just footsteps away from everything downtown. Their romance package includes chocolate-covered strawberries, a bottle of champagne, and a $50 Bluff View Art District Gift Certificate that can be used at one of the District&apos;s restaurants (Tony’s Pasta Shop or Back Inn Café). Start with the Hunter Museum of American Art, which features well-known artists like Mary Cassatt, Winslow Homer and Fitzhugh Lane, and one of the best views in the city (particularly at sunset). The Houston Museum of Decorative Arts houses the finest collection of antique glass & ceramics in America, left by the colorful and eccentric Anna Safley Houston. 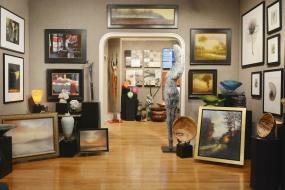 Stroll through the River Gallery that showcases museum-quality craft, studio glass, sculpted clay, metal and textiles. Then meander hand-in-hand through the outdoor Sculpture Garden complete with a permanent sculpture collection including works by renowned artists like Leonard Baskin, John Henry, Allan Houser and Isamu Noguchi. At some point you might want to make some art of your own. For that, head to downtown’s Ignis Glass Studio to blow your own keepsake ornament or paperweight. If you’re ready to get out and explore Chattanooga, stay the night on the Southside and the new Moxy Hotel. The stylishly chic hotel focuses on the less, making it easy to get out and enjoy attractions, dining, outdoor adventures, and more. Located in the city’s most popular neighborhood, you’ll find plenty of sculptures, murals, and exceptional nightlife just outside your door. Made for the young and young-at-heart, The Moxy rolls with a “it’s 5 o’clock somewhere” attitude - perfect for those who are looking for fun all day long. Only minutes from downtown, you can be out exploring the trails of Lookout and Signal Mountains. One of the most traveled hiking routes is the moderate to easy hike to Sunset Rock where you’ll get to view the amazing sunset. Dense wooded areas mixed with scenic vistas make hiking Stringer’s Ridge a local favorite. Enjoy a romantic walk through the Reflection Riding Arboretum & Nature Center to check out their animals such as the bobcat, owls, bald eagle, flying squirrel, and red-tailed hawks. 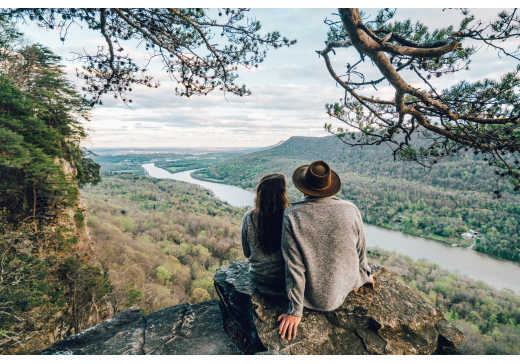 For those who love nature and a great view, head to Rock City to make Valentine&apos;s Day memories out at the infamous Lover&apos;s Leap. Top the night off with a guided lantern tour full of love stories and legends 1,120 feet underground at Romance at Ruby. 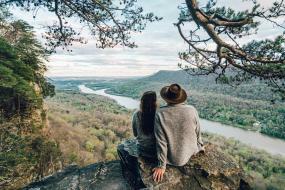 To book a romantic weekend getaway to the Scenic City, click here.